Millennials. That’s the buzzword these days. 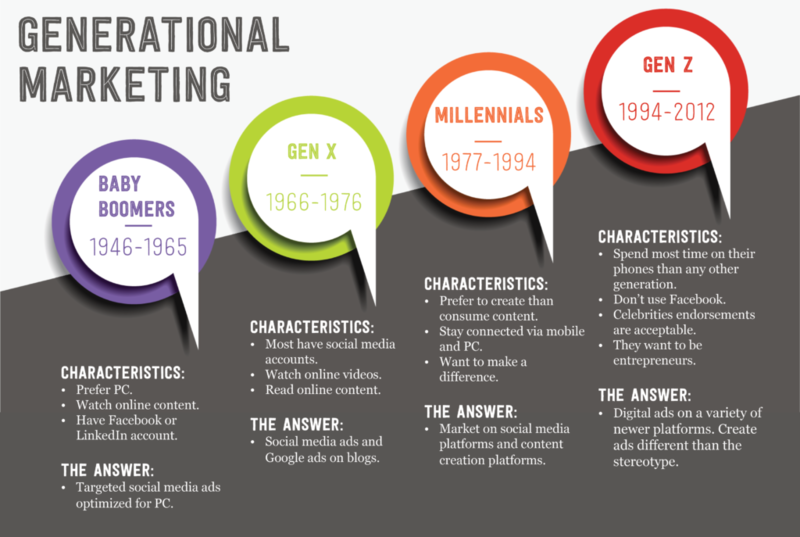 It seems today that every marketer wants to “try reaching millennials.” They’re considered a marketing goldmine to many. But there are other age groups with purchasing power including: Baby Boomers, Gen X, Gen Z, and yes – Millennials. And it’s a good idea to keep an open mind to the possibility of marketing to a different age groups versus focusing so narrowly on the revered millennials. Here’s some helpful information about each age demographic. Let’s talk about Baby Boomers first. If you’re a millennial, there is a good chance they’re your parents. Typically, according to marketing researchers at W.J. Schroer, Baby Boomers were born from 1946 – 1965. They are shoppers and buyers. A 2017 USA today article reported that Boomers accounted for 41.6% of all consumer spending in the United States – up 8.6% from 2007. Since they saw the dawn of personal computers, 80% of Baby Boomers tend to choose a desktop or laptop over mobile any day. And 25% of them spend more than 20 hours a week consuming online content. This means they are reading Google ads, they are watching YouTube commercials, and yes – they are seeing Facebook ads. According to Forbes, 82% of Baby Boomers have at least one social media account and most of these are either Facebook or LinkedIn. If your product speaks more to this generation, online isn’t a bad way to go. Gone are the days when the best way to reach people 64 years of age and older was direct mail. Your options are many and the baby boomer market, sadly, is largely ignored. They’re the smallest of the four major groups. This is due primarily to Baby Boomers not having as many children as previous generations. They were typically born from 1966 – 1976. According to How Stuff Works, they are an age group that doesn’t want to be categorized. They are independent thinkers and they believe in abstract thought. They are artists. Studies show that roughly 80% have some sort of social media account, and 78% of them watch online videos every month. They make a lot of their decisions based on information they find online, such as blogs and most of them prefer online content to TV. Marketing to them is a little tricky because they are slightly picky about online content. The best bet to reach them would probably be Google ads and online commercials with video streaming services. While the former two generations are either avid or casual consumers of content, Millennials tend to be focused on creating online content. That being said, mobile devices and PC’s are very important to Millennials because staying connected is everything. They are also believers in change – 74% believe they will make a difference in the world. And their voices are loud and clear. It’s no wonder many marketers see them as a gold mine. Finding methods of communicating TO millennials is a piece of cake because everything except direct mail will reach them. But the message that is communicated must be one of hope, possibilities, and empowerment. They’re brand new to the “adulting” thing. Even though of them have been doing it for a little while. They were born between 1995 and 2012. While some Gen Z’s are born of Millennial parents, the majority of them are the offspring of Gen X’s and they’re still trying to figure this world out. Studies show they average 15.4 hours per week on their smart phones, and 95 percent of them use YouTube regularly. This group tends to stay off of Facebook as well. Business Insider reports that only 9% of Gen Z’s claim Facebook as their preferred social media platform. Also, while this may make many a Baby Boomer or Gen X cringe, Gen Z’s are fine with celebrities endorsing their favorite products. In fact, with the rise of “social media influencers” (regular people who make a living recording their day-to-day lives and the products they use,) Gen Z’s are influenced by homemade media they are constantly consuming. Just like Millennials, Gen Z’s believe in themselves. 55 percent of them say they will own a business in the future and they’re working toward that goal – 56% of Gen Z’s have already discussed with their parents the idea of saving money. They have a bright future and they are well aware of that fact. 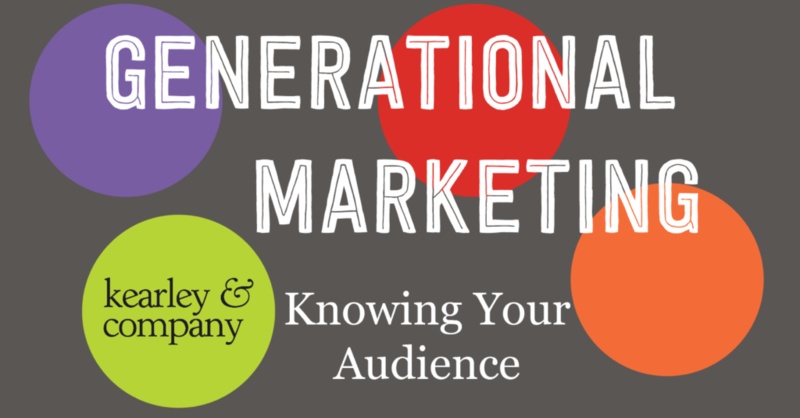 Marketing to any age group is difficult; which is probably why most marketers and company owners like to focus on millennials. They’re easy to reach and (supposedly) easy to sell to. But there is a chance you are missing a more rewarding target market by such a single minded approach. Research the generations. Find out what makes them tick. And if you can market to someone your competition is unaware of, you might just find your own marketing goldmine.